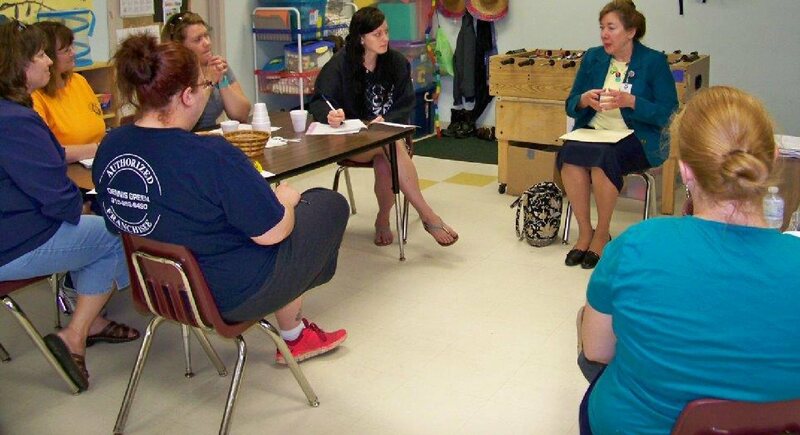 On May 12, Mary Stanton, principal of Maroun Elementary, discussed things that the children should know and/or be able to do when entering kindergarten so parents can work on them at home. Mary Stanton speaks with Head Start/UPK parents and teachers about those expectations. From left are: Becky Finkle, Phoenix 1 teacher Carole LaVoie, Phoenix 3 teacher Robin France, Sunny Christian, Jackie Micale, Mary Stanton, and Melissa Jaquay. Not pictured are Felicia Holland and Danielle Duquette. Some of the tasks are: being able to sit and listen to a story, identify the letters in their names, recognize the numbers 0-10, holding the pencil correctly and having self help skills to foster independence. Oswego County Pre-K is a program of Oswego County Opportunities.